Having reaped a record high of 15 million views on Amazing Thing Vietnam Fanpage, the Golden Bridge of Sun World Ba Na Hills was immediately featured on aa number of the world’s famous design and architecture websites. One of the most prestigious architecture websites https://www.archdaily.com featured the Golden Bridge of Sun World Ba Na Hills on July 25 to hundreds of thousands of visitors worldwide via its latest article of “the bridge with the most daring design of Vietnam”. 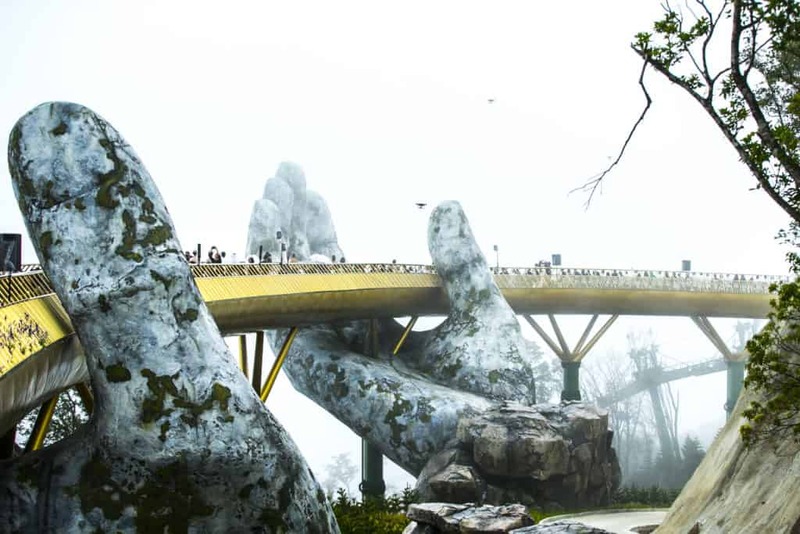 In particular, on July 25, 2018, spectacular info and images of the Goloden Bridge were carried by world famous architecture website https://www.archdaily.com I nan article entitled “Vietnam’s Daring Golden Bridge takes a “Hand-On” Approach to Tourism”. Archdaily is a world famous architecture website from the US. Architectural works selected to be carried on this website are supposed to be audacious, highly artistic and striking in professional eyes all over the world. Given its daily readership of 500,000 and 160 million monthly visits (statistics of 2016), Archdaily is comfortably ranked as the world’s most visited architecture website. The website was also voted as one of the five most famous online magazines by the Mashable’s 2009 Open Web Awards. 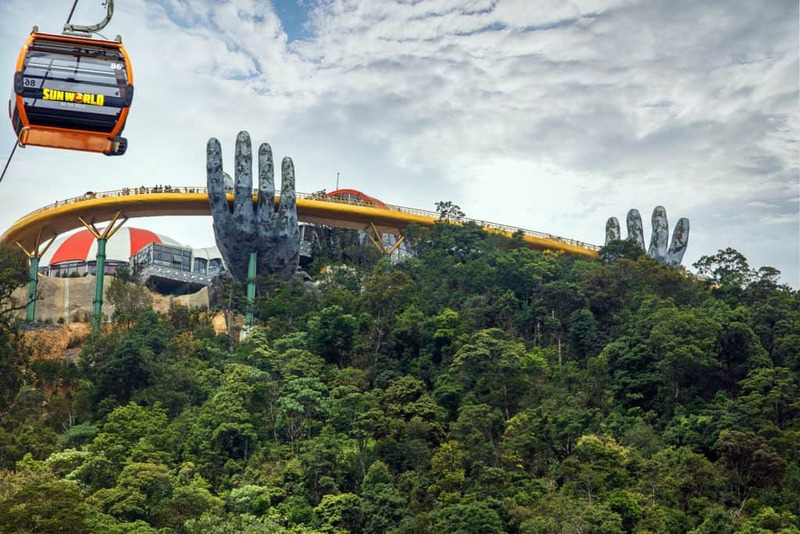 In this article, Archdaily gave some description of the Golden Bridge: “In the mountains above Da Nang, Vietnam sits a unique piece of bridge design. Winding its way around a 150-meter course lined with flowers, a golden bridge shimmers against the Ba Na Hills, supported by a pair of giant hands”. The Golden Bridge was officially inaugurated in early June 2018 as a new tourist product of SunWorld Ba Na Hills complex. Nested on the Paradise Garden, the bridge acts as a special and convenient transit to take visitors from the mountain foot or French village to Le Jardin D’Amour gardens. The bridge spans 12.8m wide and 150m long and comprises 8 arches, the longest of which is 21.2m. What strikes the hearts of all overwhelmed visitors here is the dabbled and mossy giant hands supporting the bridge. 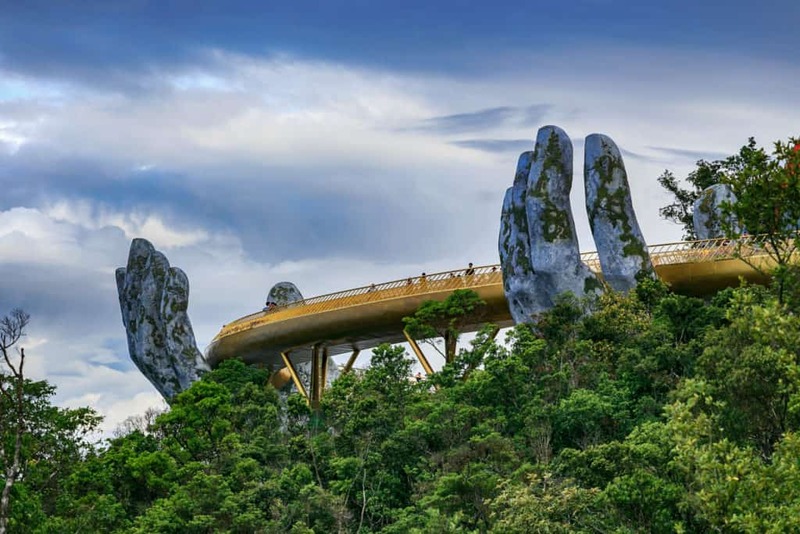 According to TA Landscape Architecture – direct design unit of the Golden Bridge – the hands are attributed to the hands of the Mountain God who draws from inside a rocky mountain a golden sash to carry mortal villagers to the Paradise Garden. At the height of 1,414m from the sea level, in the midst of the heavenly scenery of the Lord Mountain, the Golden Bridge pulls visitors into a blurry world of fairy dreams and fantasy. This audacious design of the Golden Bridge is reputed among professional architects as comparable to suspended Langkawi Sky Bridge (Malaysia), one of the most unique and recognizable bridges of the world. Since its official inauguration, the Golden Bridge has triggered a true tourist fever. Apart from visitors who restlessly took selfies and did check-ins on this unique bridge, various couples chose the bridge as their wedding photo shooting site for once in a lifetime. Dômestic artists also rushed to tap in the breathtaking photogenic moments of the Golden Bridge! In mid-July 2018, this new structure was also made a one-of-a-kind catwalk for a dozen of established models in a fashion show “A walk to the sky”. 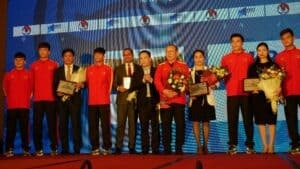 Supermodel Thanh Hang or Miss Universe H’Hen Nie guided their fairy steps on the soft, sash-like bridge crossing the heavenly backdrop of Ba Na Hills drove their fans mad. The Golden Bridge and peculiar setting of Ba Na Hills also served as a source of inspirations for fashion designers to breed their brainchildren, which were most fabulous dresses and gowns in their own solo shows.